Hi Performance Dry Wax Food Service Tissue Paper come in stock prints and colors that will liven up your take out food containers. All are printed on 15/18# paper. It is useful for Basket Liners, Food Wrap, Carry-Out Box Liners, Small Sandwich Wrap, Hot Dog Wrap and Pastry Handling. Solid Colors and Prints Available. 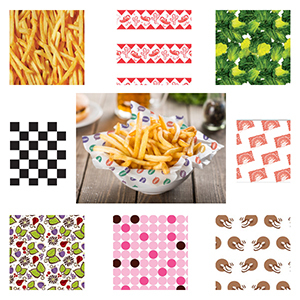 Stock patterns include: Brick Oven Red, Fiesta Red, Checks Black, Coffee House, Fresh Fruit, Fries, Go Green and Dots. Solid Colors: Caramel, Cinnamon, Cream, Grape, Bay Leaf, and Cherry.